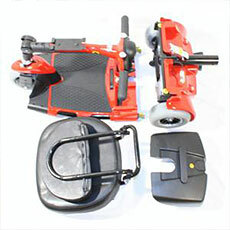 Travel scooters are lightweight, can fold or disassemble into 4 or 5 pieces and fit nicely in most car trunks. 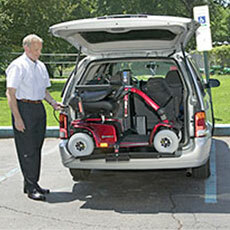 It is important that you or your caregiver can lift the heaviest piece of the scooter safely. You can find the weight of the heaviest piece of a scooter by clicking on the Details & Specs tab on the product page. For comparison purposes, a gallon of milk weighs about 7 lbs, so if the heaviest piece weighs 21 lbs it will be equivalent to lifting about 3 gallons of milk. All pieces of travel scooters have a handle to assist with lifting. Video: Watch an example of scooter disassembly. Some of our larger scooters can also be disassembled for transportation. If you do not want to disassemble your scooter, you will need a vehicle lift or ramp. All scooter batteries sold at SpinLife are approved by the Federal Aviation Administration for airline transportation. If you're planning a trip, be sure to check with the specific transportation service in advance. You can usually find this kind of information on the airline or transportation service website.